Ground Floor Flat close to the town centre of Brixham. The accommodation comprises; Spacioius entrance hall, Double Bedroom, Shower Room, Front Aspect Lounge with Kitchen area and original fire surround. The flat benefits from Gas Central Heating & Double Glazing. Viewing highly recommended. Refurbished Terraced Town House on the Berry Head Side of Brixham. Accommodation comprises; L shaped Lounge Dining Room. Modern Fitted Kitchen. Modern Bathroom. 3 bedrooms. Some sea views from the rear bedrooms and rear patio area. Gas Central heating, uPVC Double Glazing & Parking. A stones throw from Broadsands Beach! Sycamore Close is a small Cul-De-Sac just a level walk from the beach. The property is a well presented chalet bungalow surrounded by established gardens. The accommodation comprises; Large Lounge with bay window and French doors leading out to the conservatory - over looking the garden. NEW BUILD Semi-Attached house on the Berry Head side of Brixham. Spacious Lounge. Open plan Kitchen / Dining Area with space for a Dish Washer and Fridge/Freezer. Utility Space with plumbing for Washing Machine & W.C. French Doors from the kitchen lead out to the level Rear Garden, also giving access to the side access and garage. This 3 bedroom property is located in Bridgetown a short walk to the town center of Totnes. 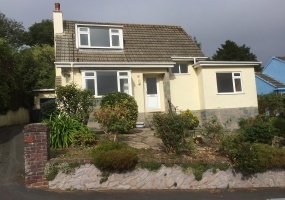 The property comprises of a nice size lounge with open fire, dinner room and kitchen, upstairs there are 3 bedrooms 2 doubles and a single, modern bathroom with a bath and shower over, and separate WC. Outside there is parking for one car and has a front and rear garden. Beautifully presented ground floor, PURPOSE BUILT flat. The accommodation comprises; Entrance hall, Lounge, Kitchen, 2 double bedrooms & bathroom. The flat is maintained to a very high standard offering bright, modern accommodation. The property benefits from gas central heating & double glazing. There is a rear court yard and grassed front garden area. Easy street parking is available. UNINTERRUPTED SEA VIEWS. 2nd FLOOR FLAT AVAILABLE. Lounge with Kitchen area and balcony off enjoying VIEWS OF BRIXHAM AND THE BAY BEYOND. Good size double bedroom. Modern fitted shower room. Allocated parking space. Communal garden. Walking distance to the town centre of Brixham. Viewing Highly Recommended. Wifi Included, Applicants over 50 only. No pets. Detached Chalet Bungalow in quiet residential area. The accommodation comprises of Good size lounge with square bay window and dining area off. Dining Room. Fitted kitchen with breakfast area. Utility area. Downstairs Shower Room. 2 double and 1 single bedroom, 1 bedroom us downstairs. Bathroom with corner bath. ** Short let only ** A 3 bedroom apartment in the Cider Warehouse development. A 5 minute walk to Totnes Mainline Train Station. This property comprises of a communal entrance hall to your main front door. L shape inner hallway. Study / Dressing Room to the Ground floor. Family Bathroom with separate shower. Large open plan lounge/diner/kitchen. Wood floor thought-out the ground floor.